PIXI Pakistan (Pvt.) Limited Islamabad. 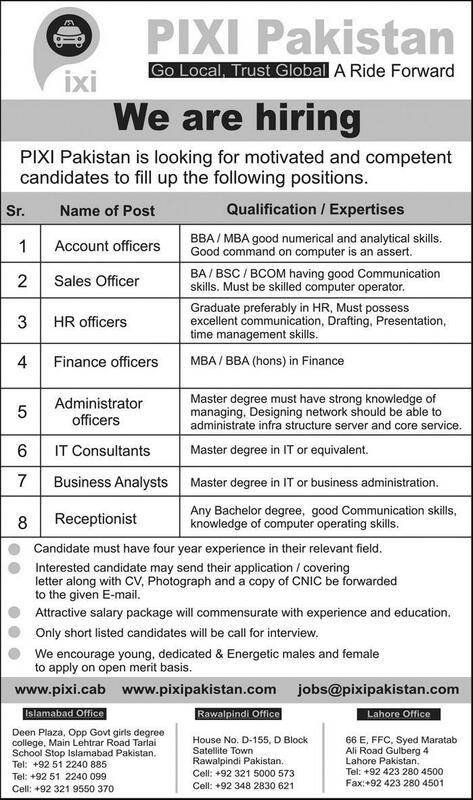 PIXI Pakistan is looking for motivated and competent candidates to fill up the following positions. Qualification / Expertise: BBA / MBA good numerical and analytical skills. Good command on a computer is an asset. Qualification / Expertise: BA / BSC / BCOM having good Communication skills. Must be a skilled computer operator. Qualification / Expertise: Graduate preferably in HR Must possess excellent communication, Drafting, Presentation, time management skills. Qualification / Expertise: Master degree must have a strong knowledge of managing, Designing network should be able to administrate the infrastructure server and core service. Qualification / Expertise: Master degree in IT or equivalent. Qualification / Expertise: Master degree in IT or business administration. Qualification / Expertise: Any Bachelor degree, good Communication skills, knowledge of computer operating skills. Candidate must have four-year experience in their relevant field. Interested candidate may send their application/covering letter along with CV, Photograph and a copy of CNIC be forwarded to the given E-mail: jobs@pixipakistan.com. Attractive salary package will commensurate with experience and education. We encourage young, dedicated & Energetic males and female to apply on open merit basis. Main Lehtrar Road Tarlai School Stop Islamabad Pakistan. House No. D-155, D Block Satellite Town Rawalpindi Pakistan. 66 E, FFC, Syed Maratab Ali Road Gulberg 4 Lahore Pakistan.